A new ratings report issued by Moodys claims that Metinvest is benefitting from “the company’s ability to generate positive cash flows even in times of a severe downturn as observed in 2009 and more recently; (2) low leverage; (3) high degree of vertical integration; (4) large iron ore reserves; and (5) the geographically advantageous location of some of its major assets.” Exactly what advantage the geography of eastern Ukraine is conferring on Akhmetov’s business Moody’s analysts don’t say. The word “war” doesn’t appear in the company’s paperwork. 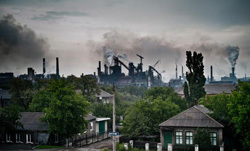 Instead, the decrease of steel production at the Yenakiieve mill (right) – located 40 kilometres northeast of Donetsk, in separatist or contested territory – has been explained by “a major overhaul of blast furnace no. 3. In turn, this and a major overhaul of basic oxygen furnace no. 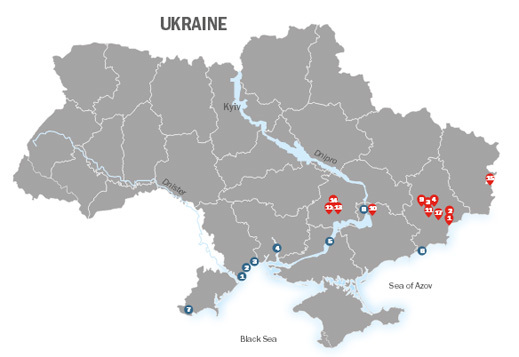 1 in May-June 2014 caused steel output to fall by 56 thousand tonnes.” What was lost at Yenakiive, Akhmetov’s accountants claim, was made up for by production growth at the Azovstal (lower left) and Ilyich Steel (right) mills, both located at the port city of Mariupol, 140 kilometres due south of Donetsk. In the second, Akhmetov mobilized his men to protect the mill from formations of Ukrainian separatists. “Thousands of steelworkers,” Metinvest claimed on May 16, “fanned out on Thursday through the city of Mariupol, establishing control over the streets and banishing the pro-Kremlin militants who until recently had seemed to be consolidating their grip on power, dealing a setback to Russia and possibly reversing the momentum in eastern Ukraine.” Local press reports put the number in the hundreds. According to a separate report on the financial performance pof Akhmetov’s steelmills, issued for the first quarter in May, sales revenues slipped in the period to $2.9 billion; that was down 8% compared to the March quarter of 2013. However, earnings (Ebitda) jumped 91% to $878 million. 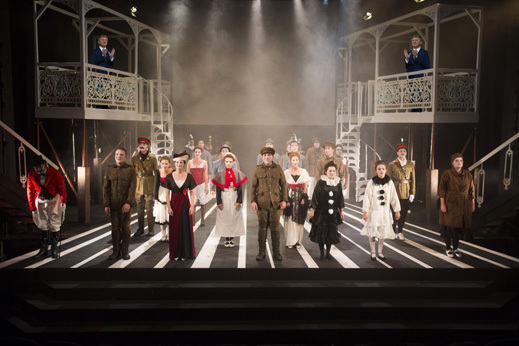 Not only doesn’t the Ukrainian war feature in this performance; but the Russian market is also invisible. The sales revenue number declined, the company says, because Metinvest’s domestic market, accounting for more than a quarter of sales, contracted. “Revenues in Ukraine totalled US$736 million in 1Q 2014, down 11% y-o-y. Despite steady sales of iron ore products on the domestic market, sales of steel products declined amid lower demand in the major steel consuming sectors (construction, machine-building and pipeline infrastructure).” On the other hand, export sales compensated slightly, rising 1% year on year. War proved to be good for business, at least in Iraq, Syria, Egypt, and Libya. “The proportion of sales to the Middle East and North Africa (MENA) rose by 6 pp y-o-y to 20%, driven by greater volumes of semifinished and flat products. The share of sales to the Commonwealth of Independent States (CIS, excluding Ukraine) was down 4 pp to 7% due to lower volumes of finished steel products, mainly to Russia.” The Russian market comprised 11% of Akhmetov’s export sales in 2013; it was down to 7% by March of this year. Export sales to Europe were four times more valuable, and they have been growing by 1%. Metinvest is registered in The Netherlands. It is owned through Cyprus entities, and it trades through a wholly-owned entity called Metinvest International S.A. which is registered in Switzerland. Akhmetov’s Ukrainian cashflow is thus subject to Swiss Government regulation. Another trading entity called Metinvest Eurasia is identified in the company’s bond prospectuses as responsible for sales to Russia, Belarus and other CIS states. Metinvest’s investment relations spokesman, Andrei Bondarenko, based at an office in Geneva, refuses to say where Metinvest Eurasia is registered to pay tax. Metinvest press and investment relations contact numbers in Kiev ring without answer, and there is no response by the company to emailed questions. 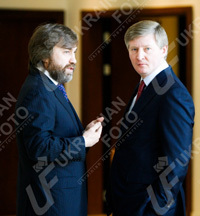 Akhmetov (right) owns 71.24% of the Metinvest shares. A 5% shareholding is held by Clarendale Limited, a vehicle of the former owners of Ilyich Steel. The second major stake of 23.76% belongs to Vadim Novinsky’s SMART group. Novinsky (left), an ethnic Russian, is doing less well out of the war. Days after the February 21 political change in Kiev, the National Bank of Ukraine put his Forum Bank into bankruptcy administration. Akhmetov’s First Ukrainian International Bank (FUIB in English, PUMB in Russian) is alive and kicking. Its releases for the first quarter this year claim its assets have grown modestly in value, while its income has jumped ahead of its impairments and write-offs. The Akhmetov bank profit to March 31 was the equivalent of $17 million; that’s 42% better than it was before the Troubles, a year ago. This result was achieved with very little cash from the National Bank of Ukraine (NBU) – a fraction of the receipts of rivals Privatbank (Igor Kolomoisky), Delta Bank (Cargill of the US), Finance & Credit (Konstantin Zhevago), Brokbiznesbank (Sergei Kurchenko), and Vizavi Bank (Vitaliy Gayduk, Sergei Levochkin, and Sergei Taruta). This week, on July 21, the war finally caught up with Akhmetov’s business when artillery struck the Avdiivka Coke Plant, setting it on fire for several hours. A Metinvest announcement avoided identifying the source of the bombardment. A BBC news bulletin claimed the incendiaries were fired by the Ukrainian military. Even if Akhmetov’s steel and bank financial reports omit to report the impact of the eastern Ukraine conflict, and the Moody’s report passes over war risk, holders of Metinvest’s 2018 $750 million bonds, which are traded on the Berlin Stock Exchange, are not so sanguine. From near-par value at the start of the year, the traded value of the paper has fallen by 17%. By contrast, the 2015 $500 million bond, traded on the Irish Stock Exchange, has been more stable in market value, although the exchange does not release current prices. The Dragon Capital chart for the bond shows the yield to maturity improving steadily since the start of this year. Akhmetov is also benefiting from the failure of domestic, Russian, or international analysts to look closely at the impact of the international aid programmes for Ukraine, which started in May. Moodys, for example, has ignored the costs side of Metinvest’s business, despite the obvious growth in costs which are part of the conditions accompanying the International Monetary Fund’s (IMF) $17 billion Stand-By Agreement. Gas, previously identified as about 11% of the costs of production and sales, should be rising sharply. Action against Akhmetov’s subsidiaries for failing to pay their gas arrears has been reported this month in the Ukrainian press. In an investor presentation this past April, Metinvest said its debts totalled $4.3 billion as of December 31, 2013. Debt repayment appears manageable this year, but a major refinancing will be required by next year. International banking sources express more scepticism of Akhmetov’s financial capacity than his financial presentations and the Moodys rating report suggest. The sources note that Metinvest recently declared a dividend for 2013, enabling Akhmetov and Novinsky to help themselves to a payout of $400 million from the 2013 balance-sheet, even though bottom-line profit was $392 million. Related-party disclosures in the financial report for that year show that 9% of Metoinvest sales go to related parties; 34% of costs come from related-party purchasing. How much borrowing and debt securitization are based on related parties has not been disclosed. The bank sources add that in the civil war conditions now prevailing in eastern Ukraine, it is far from certain Akhmetov can continue adding profits, and avoiding losses. A notice from auditors PriceWaterhouseCoopers, dated March 28, claims “the operations of the Group, and those of other entities in Ukraine, have been affected and may continue to be affected for the foreseeable future by the continuing political and economic uncertainties in Ukraine. Our opinion is not qualified in respect of this matter.” Steel industry sources say they don’t know what this means. Western and Russian sources say they are counting on the IMF to investigate the relationship between Akhmetov’s bank and Metinvest’s units in order to assess Akhmetov’s vulnerabilities. 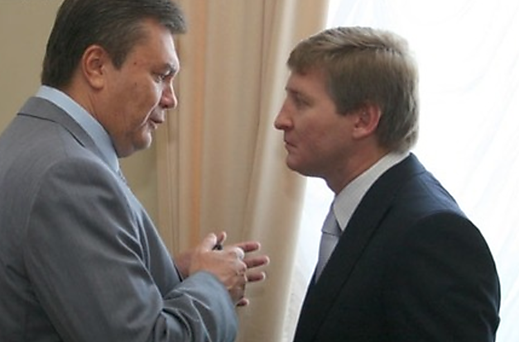 Ukrainian steel sources say that Akhmetov has few assets exposed in a combat zone. The main plants, they say, are working normally. 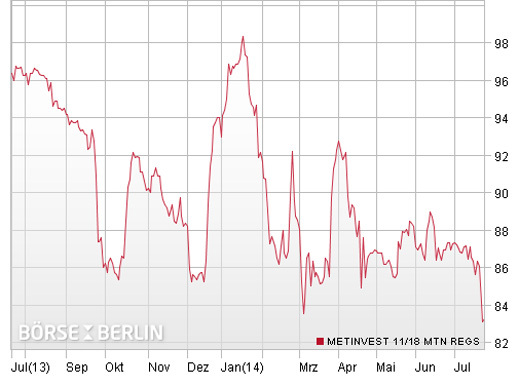 The picture for Metinvest’s coal mines is less optimistic. Local press reports from the Donetsk and Lugansk regions indicate that several mines have been forced to close, and production was sharply curtailed in June. Miners going to their jobs have come under attack this month, and have stopped work.